Driving down a frequently travelled street in a nearby town on my way to work this morning, I was amazed to see a strip of green filling in a crack right in the middle of the traffic lane. As I slowed the car at the stoplight, I realized the crack was full of plants! I looked sadly at them and thought, Good luck to you! as their future seemed pretty bleak in that spot. As the day progressed I kept thinking back to those plants growing and living in such a difficult place. I came to conclude that in all actuality, they had a pretty good place to spend their lives. But how tall could they possibly get and what kind of life is that you might be asking. I did a quick comparison to plants living in the high alpine tundra of our Rocky Mountains. 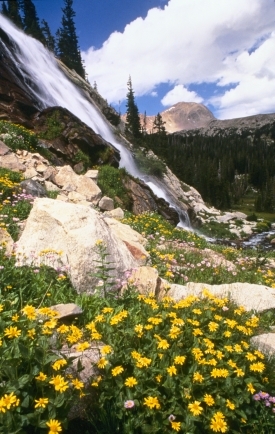 These hardy plants endure fierce temperature extremes, cold and gusty mountain winds, and varying amounts of precipitation throughout the summer months. Here in town cars racing by en masse during the multiple rush hours creates winds exceeding 40mph that our street plants endure. This is comparable to the winds of the alpine. Apline plants tend to form mats and grow out horizontally because growing upward would break their stems and end life. The street plants also cannot grow upwawrd for fear of being mowed down by cars rolling by. This and the wind factor will keep the street plants from growing upward. 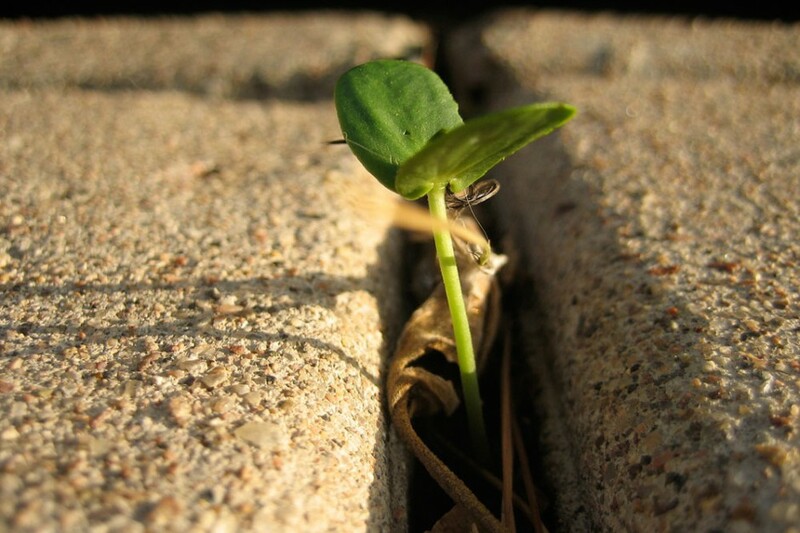 It is entirely possible that the street plants are actually one plant sending out shoots horizontally to fill up the crack, much like the alpine plants trying to take advantage of their situation. It is a smart survival tactic. I imagine that some days it gets quite loud for the plants living there in the middle of the lane with almost constant traffic. Most of us have heard about studies of people playing music for plants and insisting that it helps the plants grow healthier. I wonder if anyone has ever done a study on the effects of unpleasant noises on plants, such as engine revving, honking horns, and squeaky brakes. Perhaps this will become my PhD project. These persistent plants led me to reflect on the living situations I have had to endure and the place I live now. I have had it pretty rough and have lived as if camping for many years. Then there were concrete dorm rooms followed by a room in an apartment or house. Once I almost bought a house but decided that more space was not something I needed to survive. So what do I need to survive and flourish? Like the plants all that I require is access to sunshine, water, and food in order to grow and to continue my productive life until it can produce no more. Add in some shelter and space to move around in and I’m content. 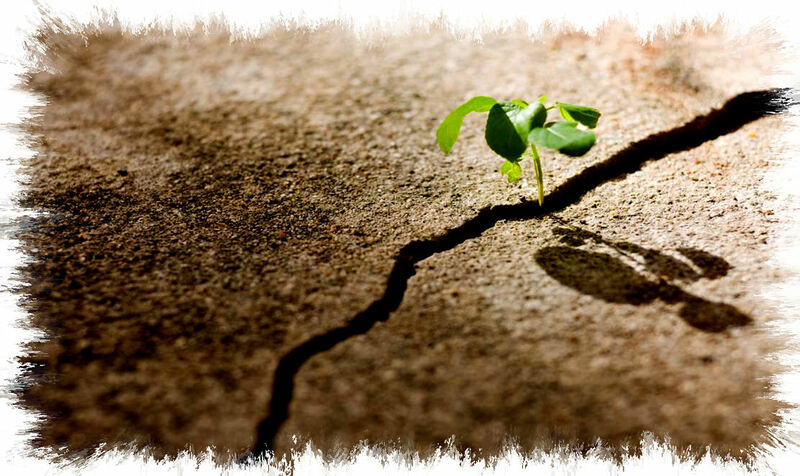 If it were a matter of survival, like the plants growing in the pavement crack, I too could learn to survive in harsh and less desirable environments than I do now. I think that most living things can tolerate difficult conditions and turn out just fine as long as they are willing or able to learn to adapt to these situations and not allow the constraints to keep them from flourishing. Today, seeing these plants thriving and full of life in a small crack in the pavement on a busy street, gives me a sense of hope and optimism for people who are growing up and living in a comparable environment. Who really needs all the bells and whistles a lawn or garden has to offer? That was so beautifully written and I too, have seen the same thing and thought what kind of life is that, but it’s so interesting how some things in life survive and thrive and we don’t expect them to.